Create an end-to-end taxi management system with maximized uptime. 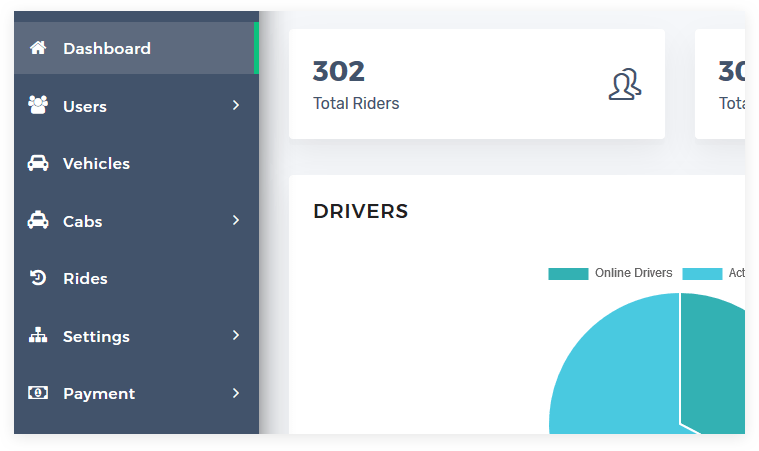 Track, analyze and improve your taxi booking operations with our modernized Uber Clone script. Made for empowering every entrepreneur to contribute to their brand’s success with unlimited and flexible modules. 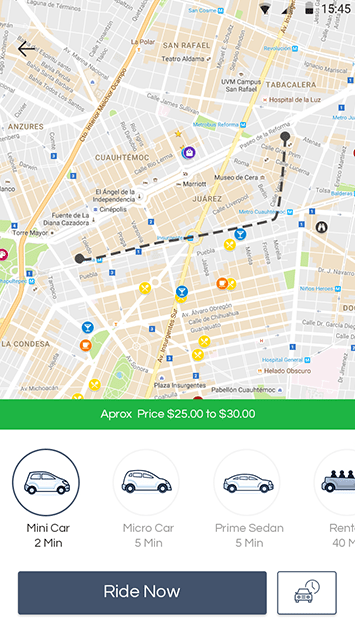 Simple – taxi booking app that should reduce complexity, not add to it. Comprehensive & collaborative Uber clone solution that becomes a central repository for all taxi’s information for staying organized. Maintenance less airtight app that will keep on track with all of its updated records. We have designed the simple and natural UI that allows passengers to book a ride in just one click. While, on other side drivers, can accept the request in one click. We provide the highest security and intelligence with our Infinite Uber Clone script. At the end of the trip, every user fare and distance will be automatically calculated. Users can pay the cost by cash or e-wallet. This taxi app facilitates users to get a chance to earn reward points by recommending apps to friends. taxi booking app? Ask us. 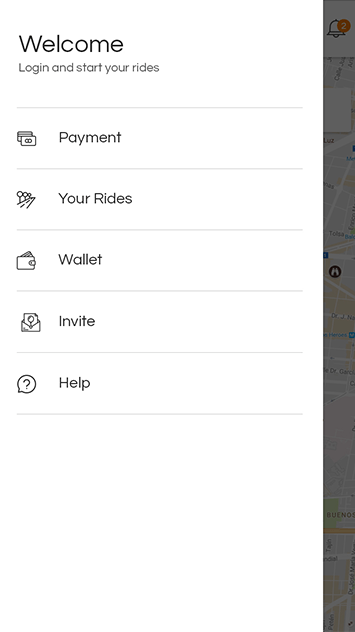 Rides/Bookings can be done in real time and it will be notified to the nearby drivers instantly from the user app to driver app. 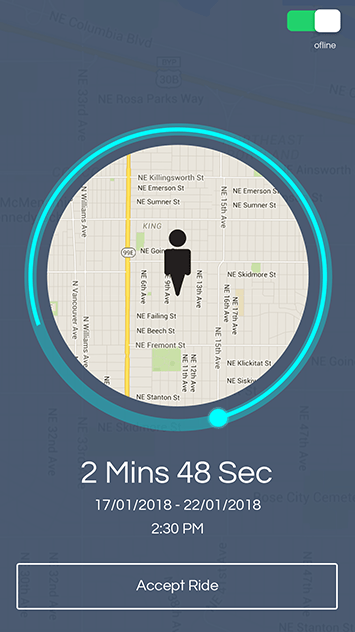 Users can schedule a ride whenever they want to by using the Ride Later feature in which will be notified to the driver by triggering a request. 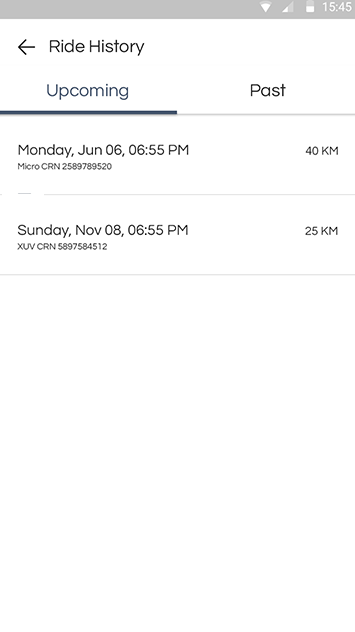 The users can view their previous cab rides through the booking history option available on the app to know the complete details of their own rides. Riders are verified at the signup using the OTP verification by Facebook account kit. OTP’s will be sent every time when a booking is done. As we have integrated the completely automatic wallet functioning system, it prevents the users from carrying on Cash or Cards with handy. 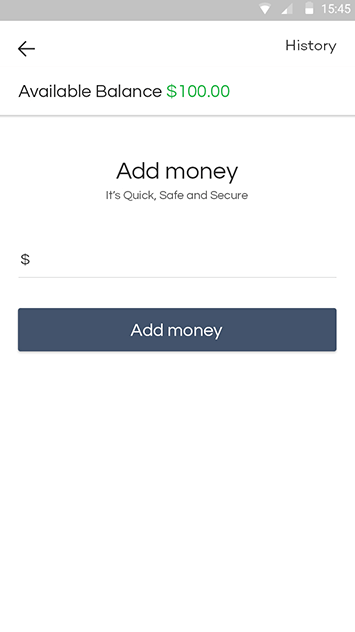 Paying via cash might be a trouble if you dont have the exact cents with you, Cabso allows users to ride cash free by using the wallet feature in the app. Cabso script is built with multiple payment options like credit and debit cards using braintree payment gateways for the user convenience. Cabso allow riders to make payment of the ride as per the convenience. Here the Riders can pay hassle-free using their PayPal accounts. 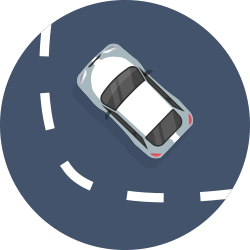 Cabso offers a tracking option that's available to track their ride status in turn by turn navigation by using in-app GPS function. 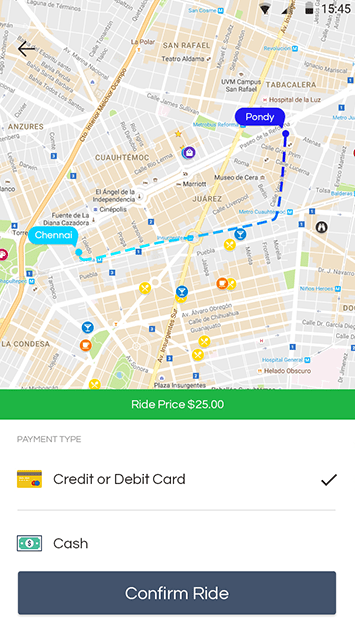 Users may check the fare estimation by simply just entering the pickup and drop address of the ride, helps to know the approximate fare for their ride. Using in-app notification services users are alerted with their ride status on the arrival of vehicle no matter the user was either in a different app. 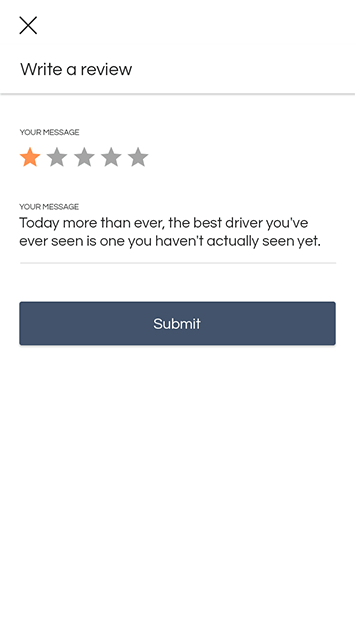 Ratings and Reviews allow users to rate their rides and write reviews helps new users to know about the driver for future rides. 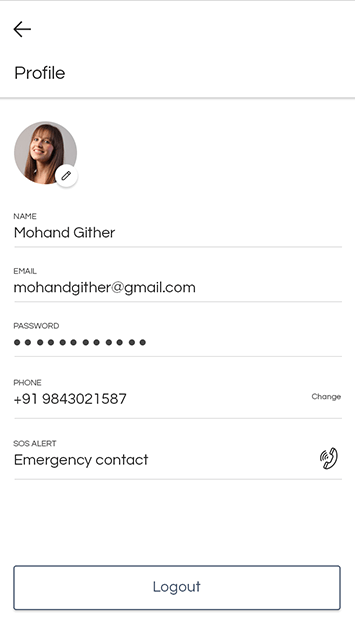 In case of emergency, This feature helps the user by just pressing the alert button their location details will be shared with their emergency contact or helpline instantly. To make the user registration process efficient and much simple, Social Media logins has been integrated with the app for easy promotional purposes. 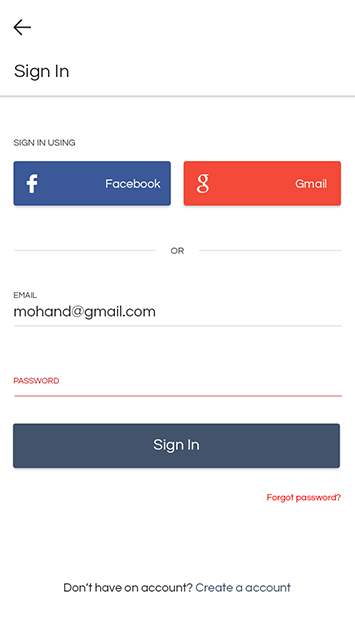 Users can signup and login to the app using their social media accounts like Facebook, Google+ in just a matter of seconds. 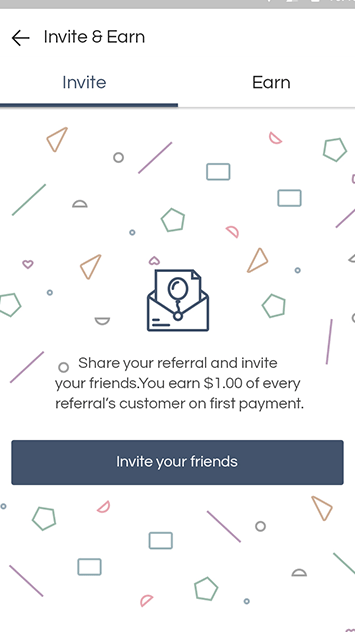 Invite features are available within the app for the users to share the app with their friends, family or companions. 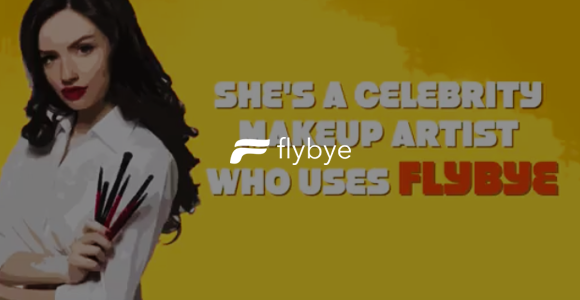 Our Cabso script comes with a website which is of a simple landing page, yet it can be customized according to the business proprietor’s requirements. 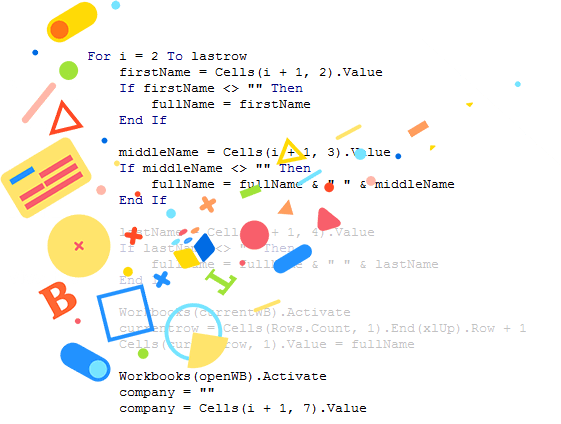 Our Cabso script was crafted like an Art by well-experienced coders though the speed and performance of the mobile app will be extremely powerful. 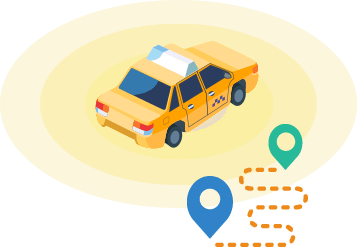 Our taxi booking app script web landing page has the ability to access your website in a responsive design and easily adjusts to any mobile phones, tablets, and desktops. 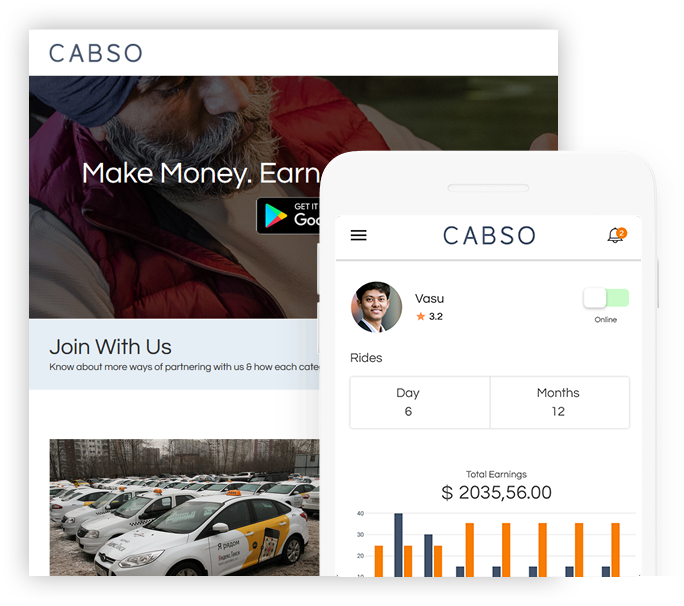 Cabso allows Admins to better manage their business individually with nitty-gritty details of management such as User, Driver, Vehicle, Rides & Payments. 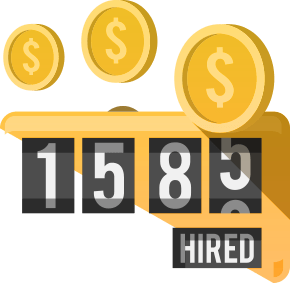 Earn commissions on every ride effortlessly by setting up flexible Commissions depending on for price ranges without investing in inventory. Settlements are the payments history received by drivers from admins which are paid by the customers through online transactions. Live Navigation feature for the drivers who don't have any knowledge on whereabouts of location to pick up the customer and have a relaxed Ride. 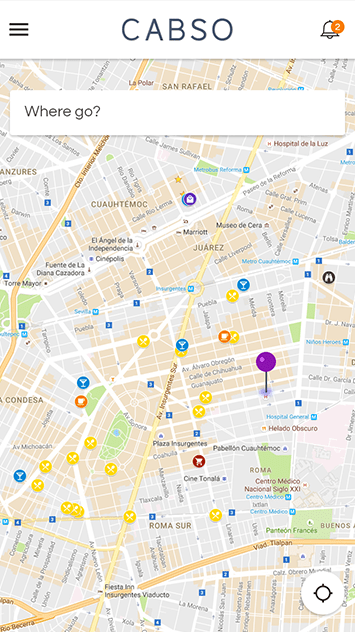 Cabso has been integrated with Google Maps for a seamless navigation to customer’s pickup & drop location. Earning is the major important part of the driver side. Cabso provides a driver with the status of their earnings in detail within the app itself. 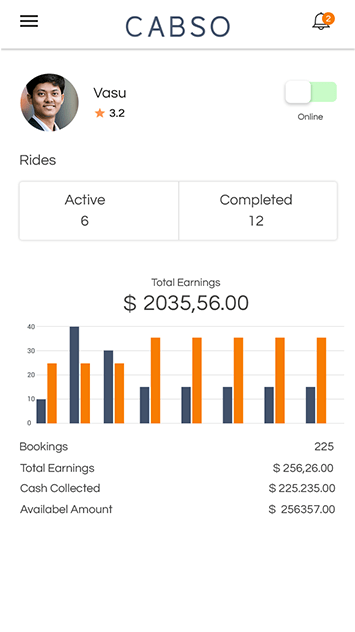 Ride history page on Cabso allows drivers to know about all the previous rides completed by him and the corresponding fare details and much more info about the ride. 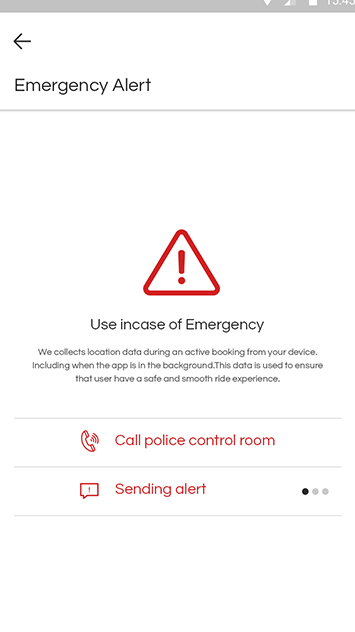 Alarm/SOS/Panic button at the top right corner of the Driver’s in-app map navigation page acts as a contact service in case of an emergency or threat. Cabso comes with an SOS/Emergency contact option for the drivers as to keep safe the drivers from causing any threats by entering the contact number. 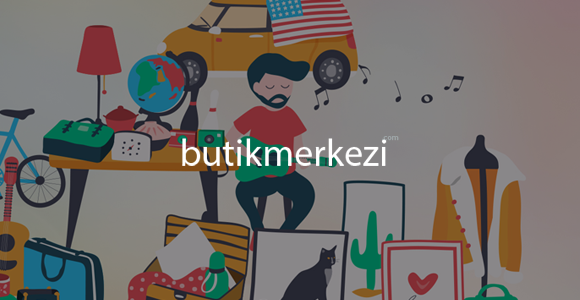 Receive rides only when you wish by turning your status online and if you need a break make your current status offline with a unique online/offline button. Users will be able to make an instant ride only when the Drivers make themselves available online so that the app will request drivers when a new ride is booked. Drivers have been granted with notification panel. It gives notification when a booking happens, a ride is ending, payment procedure, etc. The driver interface has been designed to receive a push notification from the backend server. Admin can send them at any time. 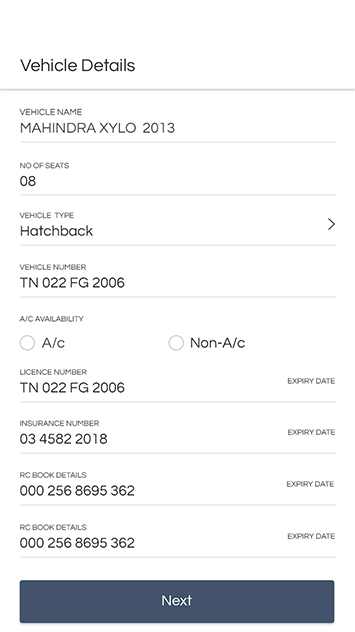 The driver may also submit all their information of License, Insurance, and Vehicle papers etc… within the app. After the submission of documents, it will be verified by the owner of the site through the Admin panel. 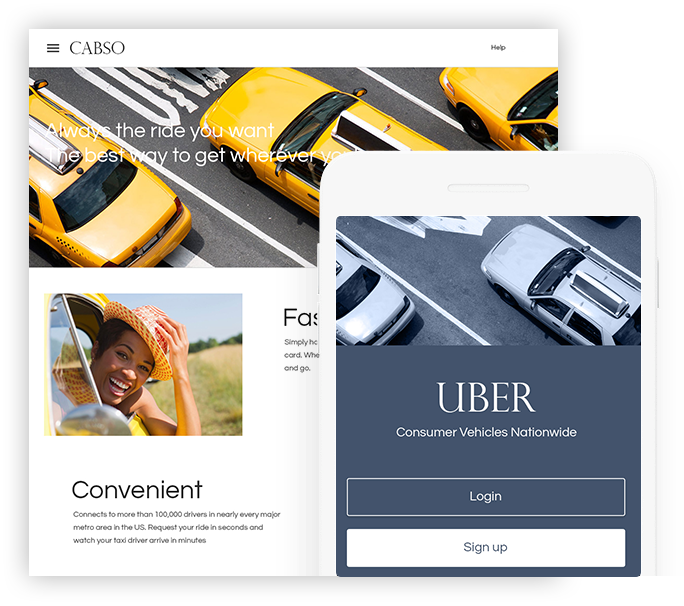 Cabso to provide best driver’s user experience was built with attractive design, yet it can be modified to your requirements like UI or custom design. 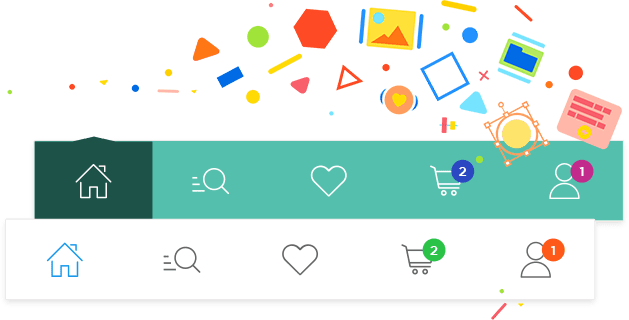 Cabso is very much highly mobile responsive as it supports in any model of Mobiles, tablets and desktop which is very much easy to use. Earn revenue by setting up flexible Commissions to drivers depending on their hierarchy or ride categories. Add fixed or percentage wise commission rules. Add tax rules and easily calculate total commission on every booking. Admin may earn commission on each ride without investing in inventory and earn commissions effortlessly. 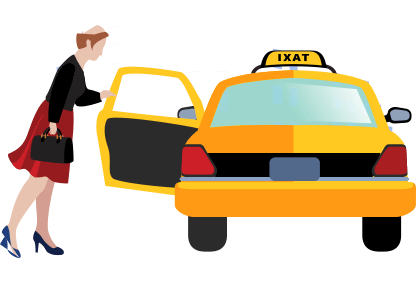 Cabso – Taxi booking app script provides Google Adsense as an additional revenue factor (Available only as Add-on) where admin can create a Google Adsense account on his own and can integrate those advertisements in the Cabso apps. The more people using the app, the more earning to the administrator. Try our feature-rich and seamless UI demo, for the best user experience and visuals to get a working view of the apps for users in iOS and Android phones. Cabso Admin panel provides the app owners with nitty-gritty details of the business like individual driver tracking & manually assigning bookings to drivers on the go, for overall fleet management. What is the latest version of cabso? What is the technology used in this clone script? Does it has wallet option? Yes, Cabso has the wallet feature. Do cabso supports multi payment option? Yes, It supports multi payment, It has built with multiple payment like cash, credit, wallet or online payment. Does it has the app notifications? Yes it has in app notifications, you’ll get notified by ride booking, arrival of driver, ride completion, payment completion. How can i signup or login into the app? Do I get any estimation of cost before riding? Yes, you can see the approximate estimation of cost before riding the cab. What about the driver and cab document management? What is the revenue factor? Admin will get commission on each ride of the cab, The commission setup can be managed in the admin panel. What is Ridenow / Rider later? Ridenow option will enable the user to book a cab & ride instantly. 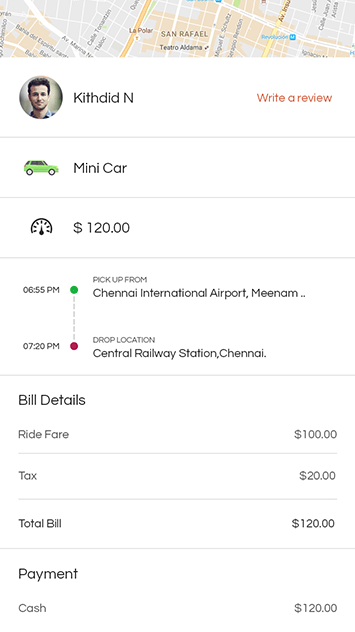 Also an user can book the cab for desired time of riding.